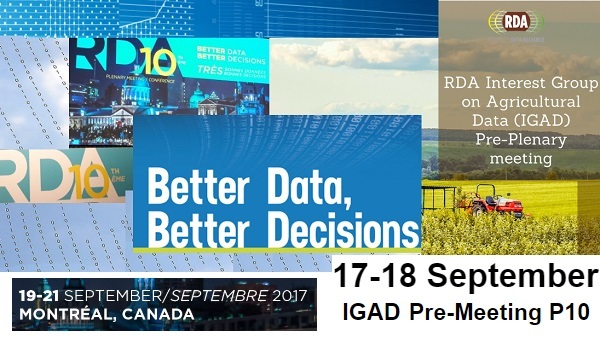 The two-day Interest Group on Agricultural Data (IGAD) pre-meeting took place in Montreal, on 17-18 September 2017, - just a couple of days before the 10th Research Data Alliance (RDA) Plenary meeting (19 - 21 September 2017). The 10th anniversary of the RDA community major event, with the overarching theme : "Better Data, Better Decisions” (BD2) was co-organized by the RDA, the University of Montreal and Research Data Canada, Canada. 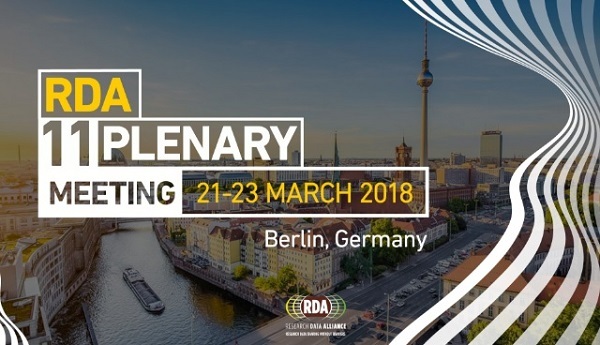 This high-level RDA community meeting attracted a number of participants from all over the world, to discuss, develop and promote data-sharing and interoperable data-driven research infrastructure through RDA Working Groups (WG) and RDA Interest Groups (IG). The IGAD Pre-Meeting P10 provided an excellent opportunity to build upon the ideas from the IGAD Pre-Meeting P9, to evaluate how the group has evolved during the last editions, what are the latest developments and to focus on research data management and semantics, in the context of synergizing efforts between open data and open tools (to achieve food security and sustainable agriculture for SDG 2030), - with special attention to on-farm data, agrisemantics, capacity development, wheat and data sharing. Global Open Data for Agriculture and Nutrition (GODAN), The Canadian Governmental Department of Agriculture and Agri-Food, and the Université de Montréal, - for their kind support that made possible this event! ... the participants discussed thematic topics and cross topics, such as data representation, publishing, interoperability and discoverability (e.g. FAIR principles) and institutional approaches (e.g. north-south and south-south collaboration). All the presentations informed about recent development within the IGAD WGs, as well as within IGAD - related areas (focused on data-sharing tools and environments available for end-users), in general. Please find below an overview of the topics covered during the IGAD Pre-Meeting P10 and ... Get inspired ! Defining the Agrisemantics vision, Sophie Aubin (INRA, France) and Caterina Caracciolo (FAO, Italy). Agricultural Decision Support using HYDRA: a semantic data federation engine, Chris Baker (IPSNP Computing Inc. aka ip-snip, Canada). Agricultural data and semantics in the emerging Internet of Food (IoF), disrupting the way we grow, process, deliver, prepare, study, eat and enjoy food, Matthew Lange (Food Product Innovation and Development at UC Davis, United States of America). FAIRsharing - mapping the landscape of data repositories, standards and data policies and making them FAIR, Peter McQuilton (University of Oxford, United Kingdom). Research on Method of Literature Dataset Construction for Domain Analysis Based on Feature Measure, Xuefu Zhang and Jingchao Fan (CAAS, China). Esther Dzale Yeumo (INRA, France) and Richard Fulss (CIMMYT, Mexico). An opportunity to influence best practices for data sharing for Agriculture Journals, Erica Mehan Johns (Cornell University, United States of America). Data Quality Principles Applied to Agricultural Research, Debora Pignatari Drucker (EMBRAPA, Brasil). How to lead the opening and use of research data in Corpoica: challenges and opportunities, Diana Maria Silva Gaitan (CORPOICA, Colombia). Updates on IGAD Capacity Development for Agriculture Data WG, Suchith Anand (GODAN, United Kingdom). Harnessing climate/weather data and technological innovations in agricultural research in Kenya, Boniface Akuku (KALRO, Kenya). Role of the On-Farm Data Sharing Working Group, Nicolas Tremblay (Agriculture et Agroalimentaire Canada, Canada) and Tom Morris (University of Connecticut, USA). Monitoring, Evaluation & Learning (MEL): Envisioning an Optimal Data Flow to achieve Development Outcomes, Sara Jani (ICARDA, Canada). Are ten pages text better than a one page table of Metadata? the need for more Data Papers describing socio economic on farm data, Pascal Bonnet and coll. (CIRAD, France). Metrics and Indicators in Agricultural Sciences Discussion Group became a Birds of a Feather (BoF) Group under RDA IGAD is open to anyone who is interested in the topic. Data Sharing Discussion Group. It is a new group that might form a RDA-IGAD “Birds of a Feather” (BoF) Group). * Since its inception in 2013, the RDA - IGAD has grown in a wide community of practice, becoming one of the RDA’s most prominent Thematic Groups for sharing knowledge and experience, and providing visibility to research and work in global agricultural and related data. Working productive events helping boost the community forward in creating workable and tangible deliverables to improve data sharing and interoperability across disciplines, technologies, and countries. The RDA Plenary 12 will take place in Gaborone, Botswana, 22-26 October, 2018, as part of the landmark event International Data Week with the theme of ‘The Digital Frontiers of Global Science’. P.S. We are a World in Data … Let's do the easy stuff first ... Connect and curate data ... and move towards a new World of Collaboration boosting benefits for everyone in the long run.